As you can see, it has been a while since my last post. You might expect me to say the trite thing, “so much has happened I don’t know where to begin”, but that is exactly what this transformation has been about. Transforming endings into beginnings and knowing that no matter where I decide to jump in or begin, it’s exactly right. That’s right… BELIEVE and breathe. Rinse and repeat, vigorously if necessary, and then do it again and again. Specifically, I started by making some changes in my home. I cleared out my basement, 10 years worth of accumulation down there, but really it amounted to over 40 years worth of accumulation in my life. Out with it. Next, the guest bedroom that had a very similar story. It was ON! I got complete with a relationship, left a job that I thought I loved in a company that I had co founded, and opened the floodgates of realizing my dreams. Though I am still in the process of “looking at my stuff”, I am accelerating my endless possibilities every day. Or maybe I’m just growing my Lotus… From the depths of the mud of my genetic encoding and my subconscious ness, where not much is visible, rising up through the watery depths of experience, and finally emerging into the light. I can see the results. My friends tell me that I am radiating. I feel it. In every cell, I feel it changing me. My new form of interior design… I’m rearranging my DNA. You can too. On 9-11-11 I actually lived a dream. I had a vision to create a labyrinth on a campground. I was planning a women’s retreat and wanted to include the powerful transformational experience of walking a labyrinth. I shared that idea with the woman I had just met who was hired to plan and promote the event. During that initial meeting, I had not become aware that an amazing friendship was beginning. I could see the interest spark within her as I described the labyrinth and explained my perception of the value. An idea that it could become a living entity at the camp that would touch many hearts and connect everyone who participated in it. She was so moved that she presented the idea to the camp owners with me and then tenaciously reminded them until a space was cleared by the camp staff and she laid out the pattern for the 5-circuit Chartres replica labyrinth herself, with the help of her children. Please watch this video that she posted. If a picture is worth a thousand words, then a moving picture is priceless. We went to camp together prior to our event, to work on completing the labyrinth. As I stepped into the center I had another vision- of women standing shoulder to shoulder together at the center, as a symbol for strength, for unity, a symbol of safety in uncertain times. I saw each woman bringing something to leave behind, a touchstone to connect them to the place and to the ritual. I shared my vision with Debby. 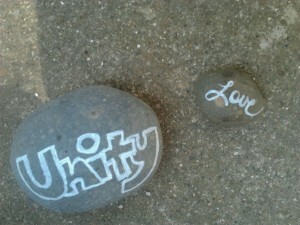 She added that each woman could paint a word that means peace to them on a rock. The vision continues to evolve. A labyrinth is an ancient, geometric pattern creating a single path that leads into the center and out again. It is not a maze, a labyrinth was originally based on a circle, a Mandala, the ancient symbol for healing, unity and wholeness. A maze offers a choice of paths, dead ends and false starts; it is the cognitive mind, or left brain, that loves to problem solve. Walking the labyrinth invokes the creative and intuitive mind, our right brain, and has been proven to create a state of calm, balance, and peace. To walk a labyrinth is to begin a spiritual journey. When the trees were cleared for the Manitowa labyrinth, one was left near the back of the outer circle, or exit path. I don’t believe in accidents. In Native American lore, a transformation tree is one that has two trunks emerging from the same root system that form a “V” at the ground level. When snakes shed their skin, they crawl through the “V” and the bark catches the old skin helping to remove it as they emerge on the other side, transformed. As one walks through the labyrinth, they can also physically step between the tree’s trunks. During that first ceremony on 9/11/11, we met in the middle and stood shoulder to shoulder. I spoke these words: “Ultimately, we have just one moral duty: to reclaim large areas of peace in ourselves, more and more peace, and to reflect it towards others. And the more peace there is in us, the more peace there will be in our troubled world.” I shared the mantra Lokah Samistah Sunkinoh Bhavntu which I translated to “May all beings in all worlds experience Love Peace and Joy in all ways always”. They sang it with me. 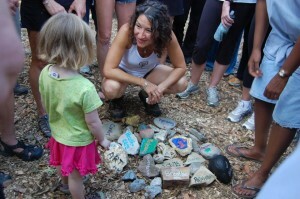 Each woman brought a rock to the labyrinth and laid it in the center oner by one. They stepped aside for one another and stood in silence, observing their intentions as each rock was placed. The last person to place her rock was just three years old. She stood in silent contemplation for a long time. So long that I finally knelt down and invited her to place her rock. She continued to decide. Finally she placed her small rock on the inside of the collection. The word she had chosen was “mama”. That signaled the end of our ritual and the women turned to make their exit, I was the first to enter and hence the last to leave. Every woman in that group chose to step through the Transformation Tree instead of going around it. I don’t think there was a dry eye in the group. Sometimes the path can seem difficult or narrow, but what I learned that day was that in community, anything is possible, and transformation is a choice. I didn’t make it back to camp for a while. I had to kneel on the path and weep, tears of joy, of realization, of humble gratitude for my Seva, for all of the love and labor and community I was experiencing, and for the labyrinth that brought it into my world. I have been creating connections and building community for my whole life. That was the tipping point experience for me to realize my own identity and my place in the world. Krtagnyatam- Gratitude for the walking in circles that lead right back to the Bhakti Path. Thank you Debby Siegel, for your vision, your energy, your dedication, and your friendship. Thank you for sharing your gift(s) Dianna. You write beautifully. Share organically. Love unconditionally. Our paths were meant to cross. Can’t wait for May 4-6.